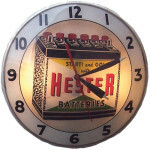 Clocks have always been a popular advertising item because people look at them so frequently, advertisers always want you looking at their name and their brand so it makes perfect sense. 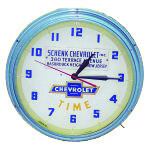 With the rise of cell phones many people don’t even think to look at an analog clock these days, but many types of advertising clocks are popular with collectors who are after a certain brand, genre, or just a nice piece to remind them of the good old days in a soda shop or auto garage. 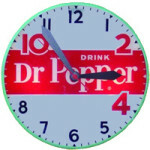 The most common type of advertising clock is a simple wall clock with a brand logo on it, many of these are backlit and some even have fancier moving lights or actions. Other clocks include desk clocks that would sit in someone’s office, or display clocks that were built into other types of items as part of a tagline like “… time for a…. “. 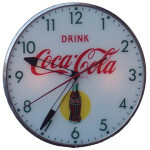 Value of advertising clocks varies by brand, age and condition but the most important factor is whether the clock works or not. 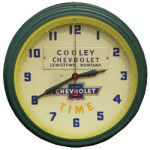 There are many collectors who will not buy a clock that doesn’t’ function and have all its original parts. Clocks are also tricky because there are some people out there who take old clocks and create faces for rare or valuable clocks to put in old bodies. Sometimes these are known as ‘fantasy’ clock when the designs were never actually used by the company, other times they are reproductions of old designs and sometimes they are just fakes trying to pass off as real. If you have an old, vintage, or antique advertising clock please contact us so that we can help you establish value, authenticity, age and condition.